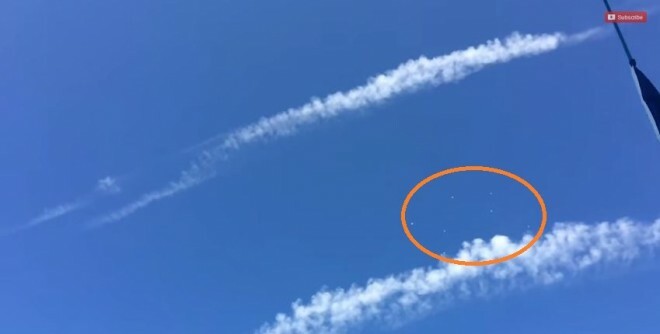 A witness who was out sunbathing captured a fleet of UFOs hovering over the skies of Normandy, earlier in September. A fleet of seven UFOs have been reportedly seen by a witness in the afternoon sky of Normandy. The exact date of the sighting is not known, but the witness states that he was out taking a sun bath when he noticed the unusual activity between the clouds. "I was on a yacht with a friend. We were sailing together, enjoying the beautiful blue sky in Normandy. I was watching a huge Chemtrail and some nice clouds while taking a sunbath, when my attention got turned away by something else (I don't remember). I stopped watching the sky for some minutes," the witness was quoted as saying by UFO Sightings Daily. When the witness turned back and looked at the sky again, he noticed "some strange little dots of light near the huge Chemtrail," he said. "As always, I got my iPhone in my pocket :-) So I immediately took it and recorded what I could. After checking on my PC screen, I counted seven white objects slowly descending inside the trail, and also disappearing behind it. It seems the huge orb is am the mothership "leading" the fleet", the witness added. "A large percentage of UFOs reported and recorded are white balls. Sometimes they look solid, but most the time they appear as glowing light. They sometimes hide in clouds and will pock in and out of them periodically. Oh...and they do make their own clouds," Scott C Warring, Ufologist and writer of the blog UFO Sightings Daily commented on that video. A dozen of UFO sightings are reported from different countries across the world in the month of September itself. Earlier last week, residents of Portsmouth, England, reported seeing a UFO hovering over their skies. A classic disc-shaped UFO was photographed in the dusk sky by residents, who were quick to share images on the social networking sites, sparking mystery and debate among sceptics and Ufologists. "I don't believe in UFOs, but when I saw this I didn't know what it was. It didn't look like a cloud, and it was moving very fast", 23-year-old Johnny Blackwell from Southsea was quoted as saying by Mail Online. "It was a grey, disc-like shape, which I know sounds like a stereotypical UFO, but that's what it looked like", Blackwell added.